About this Picnic Basket 24 Can Cooler:Picnic Basket Cooler. 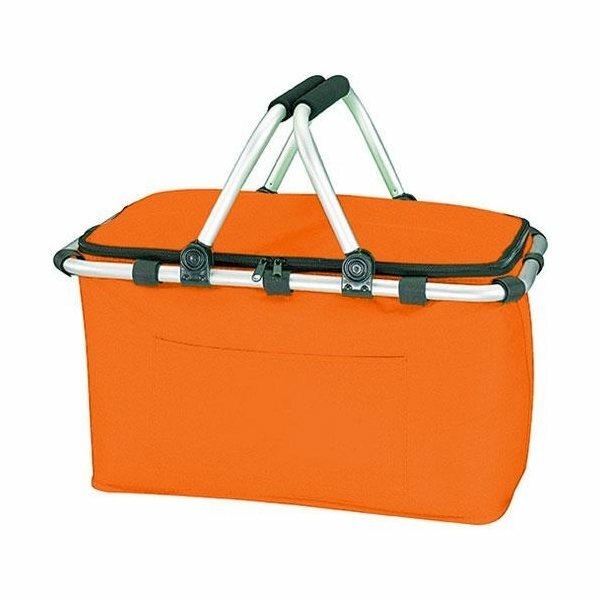 Main compartment features unique picnic basket design with dual snap closures. Holds up to 24 cans. External accessories pockets.6" handle drop height. Insulated PEVA lining. Manufactured By Leeds. Note: Instructions Included: No Materials: 600d PolyCanvasSpecial Instructions:Other imprint methods/areas may be available; please call for details. Please note that product images may not depict the standard imprint method included in pricing. About this Modesto Picnic Carrier Set:Showcase this picnic set when entertaining clients outdoors. 7-piece set includes a wine opener, two stainless steel knives and forks with polished wood handles, a polished wood cutting board, zippered canvas wrap and canvas tote that holds three bottles of wine. Durable straps for easy carry. Manufactured By Leeds. Note: Instructions Included: No Materials: 600d PCSpecial Instructions:Other imprint methods/areas may be available; please call for details. Please note that product images may not depict the standard imprint method included in pricing. About this Cape May Picnic Cooler:Part of the In Print Trend Collection, put a nautical spin on the picnic basket; this fresh cooler is perfect for outdoor events or toting your perfect dish and features an on-trend preppy striped print. Zippered main compartment. Open front pocket with Velcro flap closure. Double aluminum handles with EVA padding for extra carrying comfort. Cooler can also detach from aluminum framing. 7.5" handle drop height. Insulated PEVA lining. Manufactured By Leeds. Material: 600d PolyCanvasSpecial Instructions:Other imprint methods/areas may be available; please call for details. Please note that product images may not depict the standard imprint method included in pricing. About this Sand Dune Beach Mat:Folding beach mat with double reinforced handles.Velcro strap closure to make item portable when not in use as mat.Material: 80g Non-Woven Polypropylene.Special Instructions:1 Day Rush, available upon request for 1 color, 1 imprint location orders. About this Sunshine Beach Tote Mat:Beach tote & straw mat that stows on the outside of the tote. Finish / Material: Straw, 600D Poly.1/2" x 25" Tube Handles.6 3/4" Gusset.24" x 71" Straw Beach Mat in Outside Pocket.White Contrast Trim.Hook & Loop Closure.Special Instructions:Rush Service:1. Purchase Order must clearly state artwork instructions and logo to be used.2. One Color/One Location Imprint Only.Other imprint methods may be available; please call for details. Please note that product images may not depict the standard imprint method included in pricing. About this Paglia - Straw Mat:36" x 70" fold-up straw mat has tie-strap, handles an 2 pockets. Finish / Material: Straw, 80gsm Non-Woven PP. Biodegradable Straw Beach Mat. 80gsm Non-Woven Polypropylene Trim.Convenient Pockets.Carry HandlesSpecial Instructions:Rush Service:1. Purchase Order must clearly state artwork instructions and logo to be used.2. One Color/One Location Imprint Only.Other imprint methods may be available; please call for details. Please note that product images may not depict the standard imprint method included in pricing. About this Non - Woven Budget Beach Mat:Made Of 80 Gram, Non-Woven Coated Water-Resistant Polypropylene.32" W x 63" L Beach Mat.11 ½" Carrying Handles.Folds Into A Self Contained Case For Easy Carrying.Snap Closure.Water And Sand Resistant.Special Instructions:Rush Service:Catalog Quantities Only.One Color And One Location. About this Surf Sand Beach Mat:Folding beach mat with double reinforced carry handles.Side open top pocket.Velcro strap closure to make item portable when not in use as mat.Includes inflatable pillow.Unfolded blanket size : 35" W x 71" L.Material: Polypropylene.Special Instructions:1 Day Rush, available upon request for 1 color, 1 imprint location orders. About this Scout 2L Waterproof Outdoor Bag:The Scout 2-Liter Waterproof Outdoor Bag features a roll-top closure with a plastic buckle to keep your valuables dry and safe for outdoor activities.Clear PVC inner pocket will securely hold cellphones or other media devices, while still allowing you to use your touchscreen features.Easily snaps on to a bag or belt. Material: Polyester.Special Instructions:1 Day Rush, available upon request for 1 color, 1 imprint location orders. About this Manhattan Beach Mat:Folding beach mat with zippered closure and matching color shoulder strap.Material: Polypropylene.Special Instructions:1 Day Rush, available upon request for 1 color, 1 imprint location orders. About this Rocket Cup:Polypropylene multipurpose container. Holds a variety of items. Reversible standing legs allow item to be firmly placed in sand or loose soils. NOTE: Product comes with Prop 65 warning label. Label reads: "WARNING: This product may contain carcinogen, which is known to the State of California to cause Cancer. For more information, go to www.P65Warnings.ca.gov. Special Instructions:1 day rush is available on all in-stock items, one color/one location imprints, and laser engraved orders. About this Mambo Waterproof Storage Pouch:Storage pouch with frosted white back, transparent clear touch screen front window with zip lock and pop-up colour flap with hook and loop closure.Includes neck cord with drawstring closure.Material: PVC.Special Instructions:1 Day Rush, available upon request for 1 color, 1 imprint location orders. About this Cambria BBQ Grill:Stainless steel portable BBQ grill with two 13 1/4" x 8" grilling surfaces, two chrome plated briquette grills, wood carry handle, hinged lid, vent holes and steel legs with protective end caps. Finish / Material: Wood, Stainless Steel. About this Waterproof Dry Bag:Made Of 210T Ripstop Polyester With PVC Backing.5 Liter.Roll Top Closure With Clip For Snapping Onto Belts Or Other Bags.Floats If Dropped In The Water.Perfect For Keeping Your Contents Dry And Safe.Spot Clean/Air Dry. About this Stadium Blanket:Matching flap, handle and whip stitched edge.Hook & loop closure.Washable surface. About this Waterproof Dry Bag With Window:Made Of 210T Ripstop Polyester With PVC BackingUse Your Touch Screen Device Without Having To Remove From Inside Pocket2.5 LiterRoll Top Closure With Clip For Snapping Onto Belts Or Other BagsFloats If Dropped In The WaterPerfect For Keeping Your Contents Dry And SafeSpot Clean/Air DrySpecial Instructions:Rush Service:Catalog Quantities Only.One Color And One Location. About this Heathered Waterproof Dry Bag:Made Of 210D Polyester With PVC Backing5 LiterRoll Top Closure With Clip For Snapping Onto Belts Or Other BagsFloats If Dropped In The WaterPerfect For Keeping Your Contents Dry And SafeSpot Clean/Air DrySpecial Instructions:Rush Service:Catalog Quantities Only.One Color And One Location. About this Camo Waterproof Dry Bag:Made Of 210T Ripstop Polyester With PVC Backing 5 LiterRoll Top Closure With Clip For Snapping Onto Belts Or Other Bags Floats If Dropped In The WaterPerfect For Keeping Your Contents Dry And Safe Spot Clean/Air DrySpecial Instructions:Rush Service:Catalog Quantities Only.One Color And One Location. About this Roll Up Picnic Blanket:Blanket with PVC backing / rolls up for easy storage.Hook and loop closure. NOTE: Product comes with Prop 65 warning label. Label reads: "WARNING: This product may contain carcinogen, which is known to the State of California to cause Cancer. For more information, go to www.P65Warnings.ca.gov. Polyester Multi Color KOOZIE Easy Storage Picnic Basket 19" X 9.75"
Thank you Brianna and Jennifer! We’re glad to hear your good reviews on our promotional picnic basket. These are great to take to any outdoor event! Enjoy a nice, relaxing picnic with the KOOZIE Picnic Basket. The picnic basket will proudly show your logo. Promote your brand while on a relaxing picnic. Order your Polyester Multi Color KOOZIE Easy Storage Picnic Basket 19” X 9.75” here. With many promotional beach & picnic items available, you’ll be able to take your next outdoor trip in no time! We have picnic blankets, beach nik cups, picnic baskets, picnic coolers, beach mats, bbq grills, beach kits, insect repellents, and more! Beach & picnic items are great for any outdoor occasion! Relax outdoors with our popular picnic blankets. You’ll be able to feel calm and relaxed right underneath a shady tree or umbrella! The great outdoors can offer so much to everyone! Let your logo be displayed on a promotional beach & picnic item. Look through our selection of beach & picnic. Shop here! Just like our customers, AnyPromo sets the bar high when it comes to making a big brand impact while getting the best bang for your buck! Search our beach & picnic inventory to find what best fits your promotional goals. All too often, marketers do not follow theme giveaways. If you know you’re exhibiting at a trade show during the summer months, giving beach and picnic promotional items will definitely favor your booth. Let’s make marketing make sense! Beach & picnic items are great for everyone to have! They are fun items that customers can take outside their home and market your company! Shop through our selection now! Below you’ll find a list of some of our trending promotional beach and picnic. Every item is available and waiting for you to order. Promotional beach and picnic items are great for any event! Customers will love to receive these to take on any outdoor trip! Our featured list of beach and picnic items are great for any event! When it comes to beach and picnic, you’ll definitely get your money’s worth.